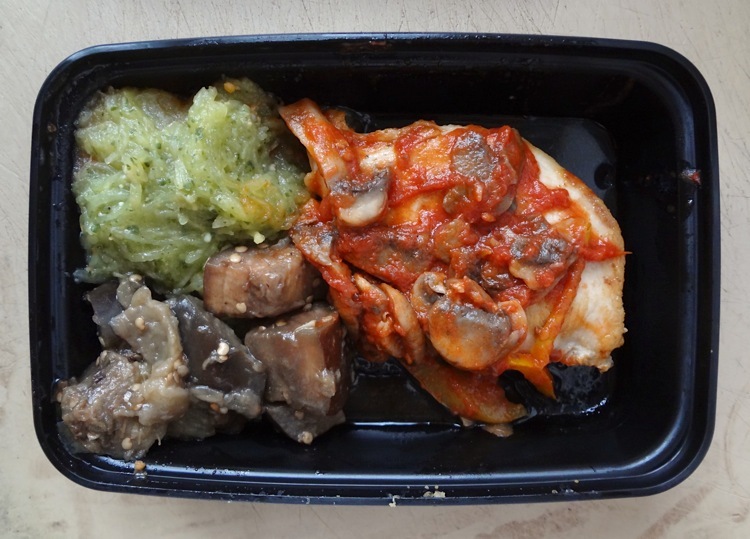 The last meal I had was chicken cacciatore with mushrooms and bell peppers, spaghetti squash with fresh basil pesto, and sauteed eggplant with basil. It was not a bad meal to end my run with FD. For some reason, I have never thought to serve spaghetti squash with pesto. It worked pretty well, which is quite the thing for me to say. I think the more recognized pairing of spaghetti squash with red sauce is fairly abhorrent. Don’t give me squash and make me pretend it’s pasta. But I guess since pesto is a lighter texture with a brighter herb flavor that it pairs better with squash. As for the eggplant, I couldn’t taste any basil. It was just sauteed eggplant as far as I was concerned. The chicken was, for a second day in a row, not dried out. So, +1 point. Almost at the end! Today was supposed to be my last day, but I still have one little container of food in my fridge. 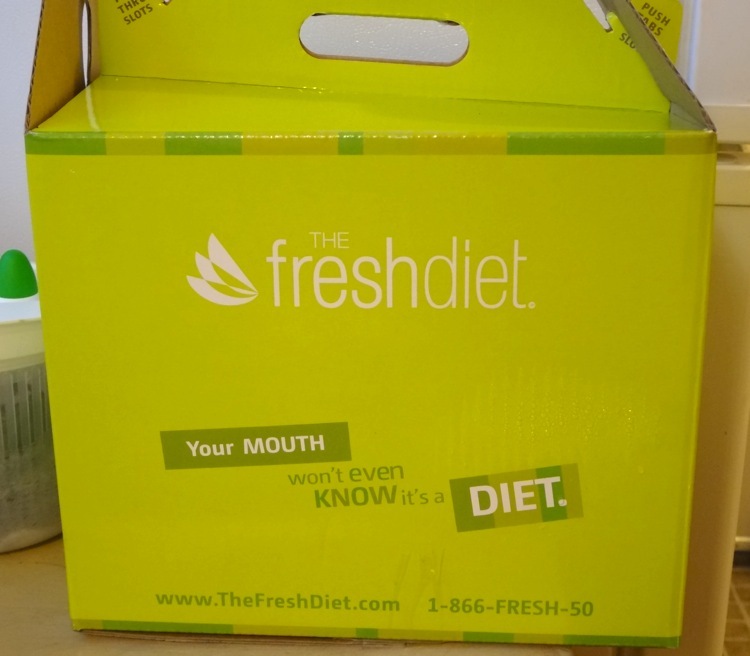 The Fresh Diet knew that I didn’t have any pending orders in their system. This morning when I went to pick up my food, I was greeting by a big green FD box instead of the thick insulated bags I had been accustomed to. 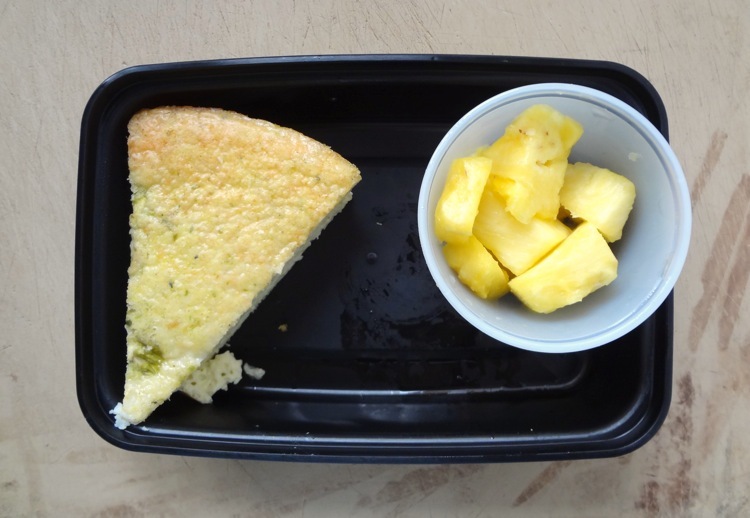 Breakfast – Asparagus, basil and mozzarella egg bake with pineapples. There was not nearly enough basil, in my opinion. The fragrance was there, but it looks like they were crushed into tiny specks. It’s a shame because I love basil. Perhaps my slice of egg bake just didn’t end up with enough. Still, it gets +1 point, because there were no surprises here. 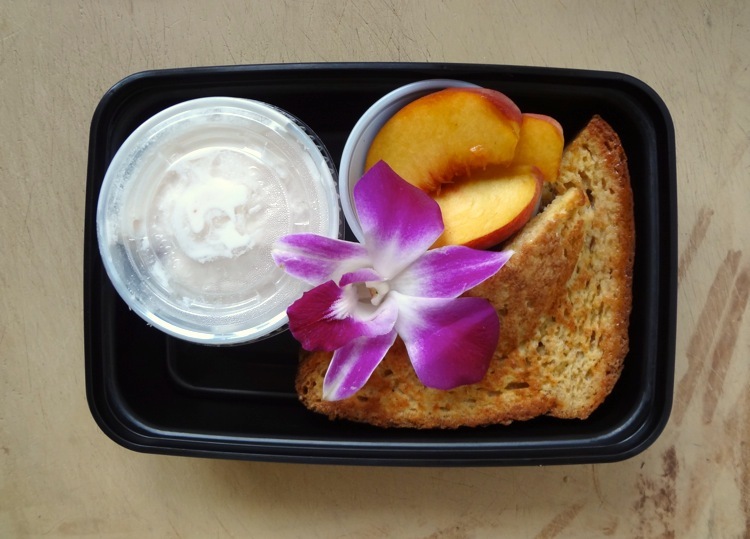 Breakfast – plum stuffed honey wheat french toast with peaches and strawberry ricotta. +1 point. I wanted to give this zero points but I think it was mostly because I don’t think french toast should try to be healthy. In my world, french toast should be made with delicious challah bread. I also wanted more maple syrup. I didn’t get any on the side this time. My french toast was already “dressed”. Also, I seem to be weirded out by the idea of having ricotta on anything that isn’t lasagna. All of my issues though had nothing to do with the dish itself, so I refrained from penalizing it. 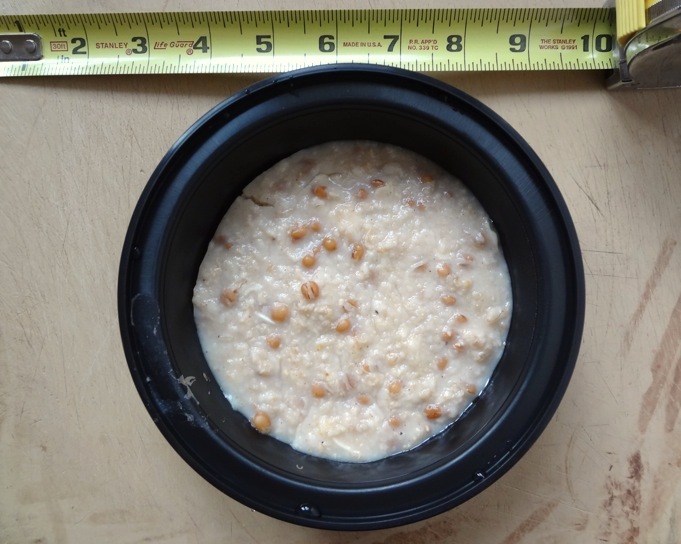 Breakfast was oatmeal with wheatberries, raisins, and oatmeal. I would have given this +1 but honestly it wasn’t as delicious to me as the oatmeal with coconut and pineapples that I had on day 1. It was less gluey but I felt like the flavor was lacking a little. But, perhaps, it is more the fact that I thought I tasted ginger powder in it, and I think cinnamon is more the way to go with breakfast. Since I’ve decided that I’ll never make this on my own, I’ll give it zero points. 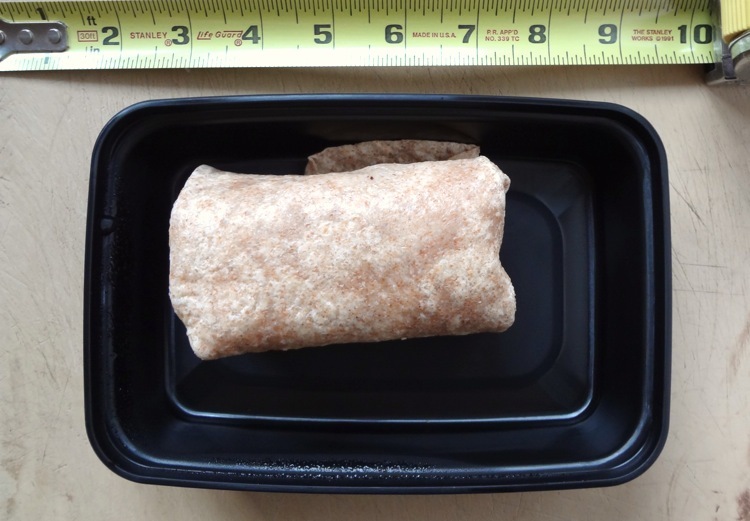 On the brighter side, I was fairly content with my lunch fare: a cheese steak wrap with mushroom. +1 easily. It is also a very boring picture. haha. I have learned my lesson quickly. I am not someone who can live on 1200-1400 calories a day, even if that food is being cooked for me. Since I’m not actually on a diet, there’s no reason for me to suffer through. I firmly believe in eating enough to feel satisfied. And as I have grown wiser with age, I try to eat balanced meals. It’s still a skill I’m learning, but it’s what I believe in first and foremost. So, as I am trying out the Fresh Diet, I am also supplementing my meals as I see fit. 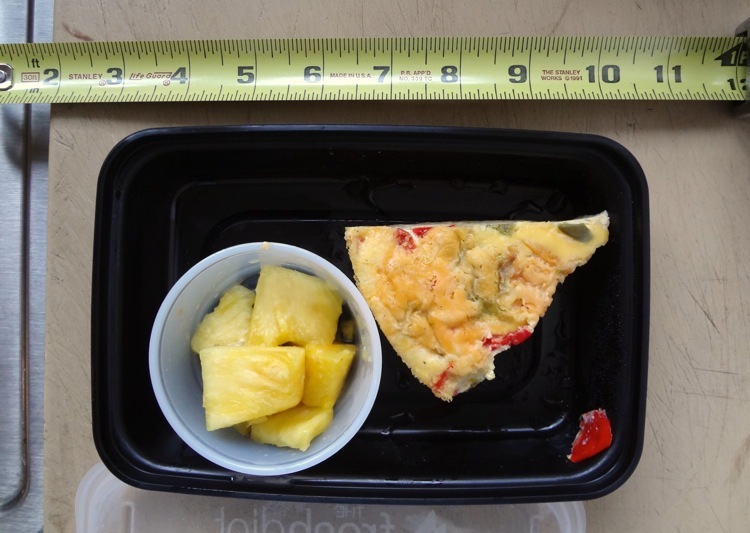 Breakfast today was a wedge of a cheese and bell pepper egg bake with a side of pineapples. The omelet, texture-wise, was interesting. I reminded me of the old days when my mom would make a steamed egg dish made of nothing more than eggs and water, mixed well. (We used to top it with oyster sauce. Do any other Asian families do this? Or was it something my mom made up?) It looks dense but tastes light. Flavor-wise, it was nothing unexpected and it was pretty straightforward. I will admit that I ate it as a snack at 10:30a. My actual breakfast was half an avocado mashed on some ak-mak crackers (it has been my go-to breakfast all summer). Good thing too, if you ask me. Strange truth – not only does oatmeal not stay my appetite in the morning, but eggs don’t either. There was no way in hell that tiny wedge of omelet was going to tide me over from 7a to 10:30a. (10:30a is my snack time. My tummy is like a clock when I’m at work.) 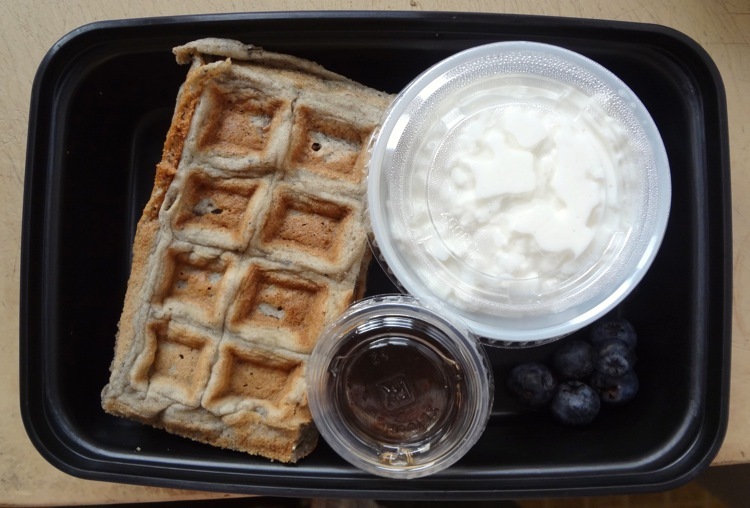 Breakfast gets +1 point.